We are YOUR Real Estate Buyer’s Agent which means we will help you buy your next home! We are your advocate and your support through the home buying process (offer, negotiation, inspections, settlement etc). We can help you buy any house on the market, regardless of who is representing the seller. They have a Seller’s Agent on their team. Now you have an EveryHome Buyer’s Agent on yours. 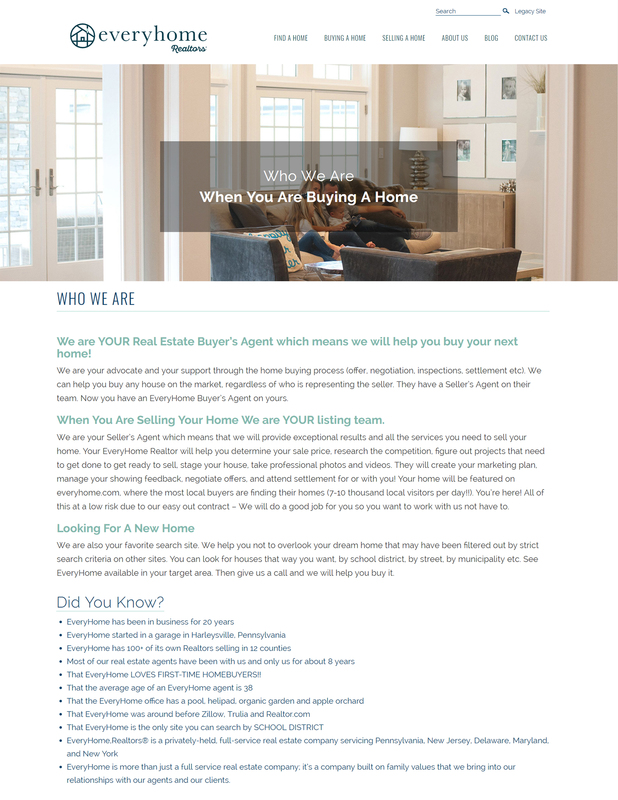 We are YOUR listing team. We are your Seller’s Agent which means that we will provide exceptional results and all the services you need to sell your home. Your EveryHome Realtor will help you determine your sale price, research the competition, figure out projects that need to get done to get ready to sell, stage your house, take professional photos and videos. They will create your marketing plan, manage your showing feedback, negotiate offers, and attend settlement for or with you! Your home will be featured on everyhome.com, where the most local buyers are finding their homes (7-10 thousand local visitors per day!!). You’re here! All of this at a low risk due to our easy out contract – We will do a good job for you so you want to work with us not have to. We are also your favorite search site. We help you not to overlook your dream home that may have been filtered out by strict search criteria on other sites. You can look for houses that way you want, by school district, by street, by municipality etc. See EveryHome available in your target area. Then give us a call and we will help you buy it. That EveryHome LOVES FIRST-TIME HOMEBUYERS!! EveryHome is more than just a full service real estate company; it’s a company built on family values that we bring into our relationships with our agents and our clients.